Forgive me for writing a review about an older book - I picked up this beauty in a second hand book sale. 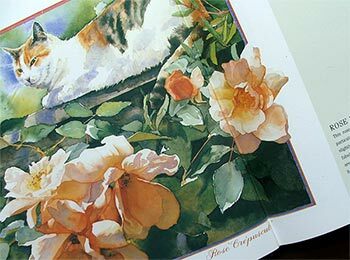 This New Zealand artist and gardener chooses two of the most perfect subjects to paint - cats and flowers. Her floral watercolours can be found on calendars and prints. There's an old world cottage garden feeling to the rose pictures, and many have a resident cat - either wandering around and about, or posing enigmatically, as only cats can. All cats are named, too - a nice touch. And all roses have their story told - their breeding, and their special style. The rose in this photograph is the climber Crepuscule. It's thornless, and beautifully apricot in colour. The cat is Pebbles Hunt-Bell of Auckland. Nancy Tichbourne writes well, too. The story of her creative art makes good reading, and she gets my vote for confessing to being one of 'the nutty cat people'.